I loved this book! The mystery kept me guessing with a cast of characters who pulled me in and made me ask so many questions. 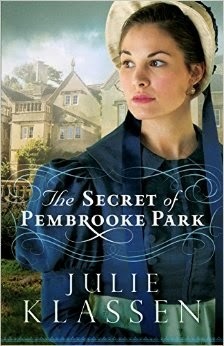 I truly enjoyed how Julie unrolled the mystery of Pembrooke Park and all involved. I held many ideas but never was 100% sure if I was correct in my guesses until the very end. And the many answers to those many questions were revealed in stages, which kept me turning the pages anxiously awaiting more. I also loved Abigail and her insecurities--ones so many women can identify with. She was an authentic character whose development grew in perfect pacing with the rest of the story. The romance aspect and who she'd end up with was also believable and sweet, allowing for questions of a whole other manner. All together, this book kept me drawn in from page one with so many layers and elements that it will be sure to sit on my shelves for years. I happily give The Secret of Pembrooke Park 5 out of 5 stars. I usually read contemporary, so thanks for introducing me to Pembrooke Park. Sounds like a good book. It was so good, Jackie. I'm a contemporary first, too but lately I've found some great historicals! I love historical and this sounds very good!